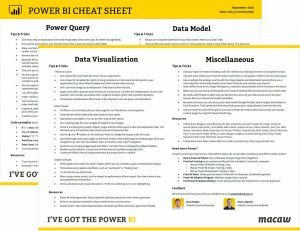 Power BI Cheat Sheet - free to download at the Modern Data & AI blog. The Power BI Cheat Sheet contains a lot of best practices, tips, and tricks regarding Power Query, Data Modelling, Data Visualization, and some miscellaneous topics. Maybe the best part of the Power BI Cheat Sheet is that it’s available for free at https://bit.ly/cheatsheetpbi. No registration required, just download the PDF and check it out! Feel free to share the PDF around, but remember.. every month or two we make a new and updated version! So sharing te link with others is the best option. The Power BI Cheat Sheet is an initiative by Dave Ruijter, with contributions from all over the world. Special thanks to Marc Lelijveld, Wouter Zijlstra, Anne Merel Tolsma for their contributions!